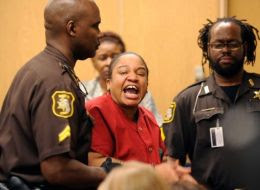 A Detroit mother accused of killing two of her children and storing their bodies in a freezer yelled during separate court outbursts Thursday that she killed them. Mitchelle Blair was temporarily removed during the custody trial to settle her parental rights to her surviving 8-year-old son and 17-year-old daughter. She was arrested March 24 after court deputies carrying out an eviction at her apartment found the bodies of Stoni Blair, 13, and Stephen Berry, 9, in a deep freezer. Police believe they died months apart in 2012 and 2013. Blair is charged with murder, torture and child abuse. She is to undergo a mental competency exam before a June 19 probable cause hearing in the murder cases. As a videotape was played Thursday in court showing Blair's surviving son telling a social worker that he saw his brother get killed by their mother, Blair yelled that he "didn't see me kill Stephen, 'cause it was unintentional." On another occasion Blair yelled: "Everybody wants to know. Yes, I did kill her," referencing Stoni. Blair's surviving son also said in the interview with the social worker that he was whipped with a cord and that his 17-year-old sister was hit with a hammer. Both surviving siblings have been placed in a relative's care. Thursday's trial in Wayne County Circuit Court will determine if Blair loses custody of the two children. The state also wants to end the parental rights of their fathers. The state says the fathers rarely see the kids and owe thousands of dollars in child support.